Mobile phones are useful to ensure that you are reachable as long as the network coverage permits. However, sometimes it may be frustrating to receive calls especially while you are in meeting, sleeping or in the midst of handling something urgent. Here is a useful freeware, named as Do Not Disturb that is able to help you handle those annoying calls targeted for Windows Mobile devices’ users. As the name implies, it is mainly targeted for those users that want to get rid of any disturbance in certain scenario. Users can simply download the .cab file and install into their mobile devices or Pocket PC and can start using it immediately. Basically there are 3 main profiles that users can set, namely Default Profile, Sleeping and Working mode. Each of them has their own default settings that make them suitable to be used in different environment. For instances, users can select Working mode so that it will either block unknown numbers, or only allow certain numbers or selected category to reach you during certain time frame. That is not all, users are allowed to add new profiles to make it fully customizable and best fitted to own preference. Good thing is, even when certain calls are blocked, still the missed calls will be displayed on your mobile devices so that you can keep track of those and call them back when the meeting is over. 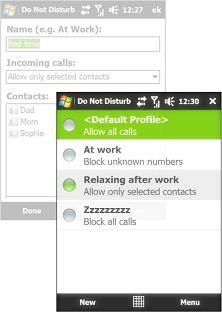 Do Not Disturb is compatible with Window Mobile version 5, 6 and 6.1. It is currently in beta version and is free for download here.